Here are the prints made by local artists. 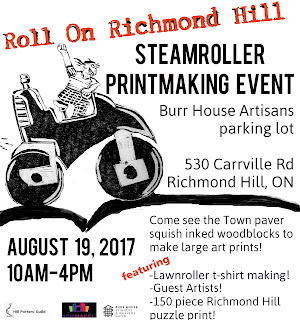 Roll On Richmond Hill is a Steamroller Printmaking Event being held in the back parking lot (BTW this means *NO ON-SITE PARKING*) of the Burr House Artisans shop on Saturday August 19th between 10am and 4pm. Three guest artists, plus the event's host, Katie Argyle, have been busy hand-carving a 20" x 30" block of birch plywood for this event. In addition, one steamroller-made print by each artist will be on display and for sale in the Burr House Artisans Shop right after its creation. 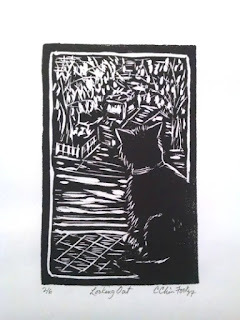 All the printmakers are showing work in the Burr House right now. Each one of them has printmaking experience, two of them have done steamroller printing before. All artists are based in Richmond Hill. Haleh Delavi and Alexandra Conrad are working together to carve one block. Both are members of the Richmond Hill Group of Artists. 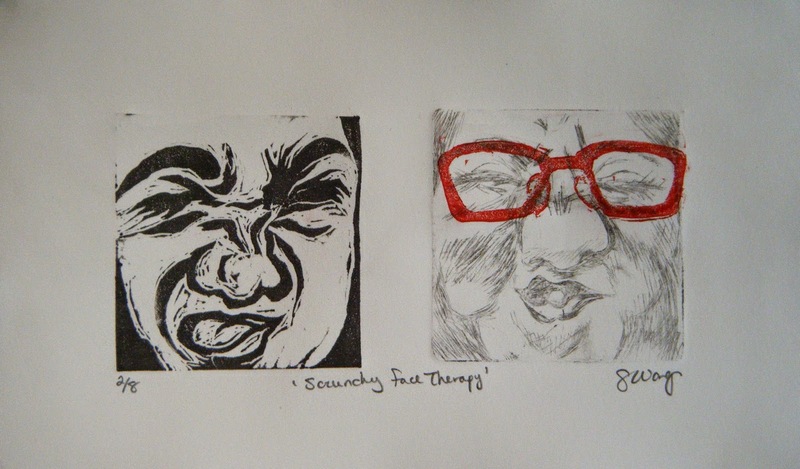 Sharlene Wong is a printmaker with steamroller printing experience. She works in all forms of printmaking: relief and intaglio. 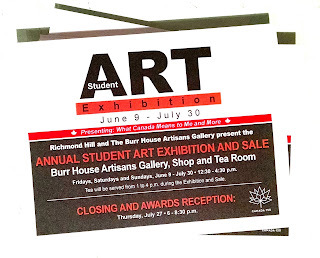 Featured in the Burr House Gallery and Tea Room are artworks created in the classes and workshops offered by the Town of Richmond Hill. abstracts and mixed media pieces are on display. For many students, this is their first time participating in an art show. We are proud to host their work, as well as the work of returning exhibitors and instructors.